Cases recently completed at Mansfield Magistrates’ Court. Mark Kavanagh, 32, of Mary Street Kirkby admitted assaulting two females by beating them and assaulting a police officer. He was committed to prison for six weeks. Offence committed whilst recalled on Home Office License. There was a victim surcharge of £115 and a restraining order was made. Stefan William Coupe, 24, of Davies Street Sutton admitted assaulting a female by beating her and damaging a door. A restraining order was made he was fined £200 with £30 victim surcharge and £100 compensation. Ian Pitchley, 46, of Watson Street Warsop admitted assaulting a female by beating her. He was fined £200 with £30 victim surcharge and £85 costs. Sarah Nancy Smith, 43, of Laurel Avenue Forest Town admitted assaulting a male by beating him. She was discharged conditionally for two years with £20 victim surcharge and £85 costs. Christopher Thomas Harris, 32, of Farmilow Crescent Mansfield admitted assaulting a male and failing to surrender to bail. A community order was made with an alcohol treatment requirement of six months and a rehabilitation activity requirement of 10 days. There was a £85 victim surcharge and £50 costs. Darren Frost, 30, of Jepson Road Sutton admitted assaulting two prisoner custody officers and damaging a cell door. He was committed to prison for 10 weeks with £100 compensation to each complainant. Michael David Holmes, 32, of Chaucer Crescent Sutton admitted driving with 57 mcg of alcohol in 100ml of breath when the legal limit is 35 mcg. He pleaded guilty to driving without insurance or license and possession of cannabis. He was fined £80 with £30 victim surcharge and £85 costs and banned from driving for 16 months. Nikki Hammond, 19, of Commercial Gate Mansfield pleaded guilty to jointly stealing cosmetics to a value of £43, £195 and £375 from Boots; a Moschino handbag worth £7 and other handbags worth £300 from TK Maxx. A community order was made with an unpaid work requirement of 100 hours within the next 12 months. He was ordered to pay compensation. Jamie Peter Cooke, 32, of Northwood Avenue Sutton admitted stealing a drink and amber leaf tobacco worth £21.47 from Asda and a post office card. He admitted stealing £30 cash from a female, assaulting a female by beating her, stealing whisky valued at £67 from the Co-op, groceries valued at £14.60, tobacco and energy drink worth £14.50 from Co-op and two trays of chocolate orange to the value of £45, chocolate valued at £65 from Co-op. A community order was made with a drug rehabilitation requirement for six months. He was ordered to pay compensation and costs of £50. Jordan Shawn Harris, 22, of Commercial Gate Mansfield admitted stealing a bluetooth speaker worth £14.99 from B&M Bargains. It was committed during the operational period of a suspended sentence order. A community order was made with a three month curfew requirement and electronic monitoring and victim surcharge of £85, with £85 costs. Samuel Henry Brunt, 29, of Elton Court Mansfield admitted assaulting a male by beating him, and damaging UPVC windows. A community order was made with a 30 days rehabilitation activity requirement and ordered to pay £300 compensation. 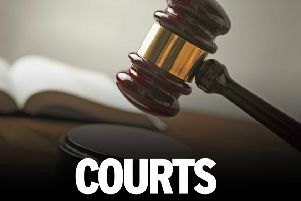 Mihai Daniel Andrei, 24, of station Street Mansfield Woodhouse admitted driving with 82mcg of alcohol in 100ml of breath without a licence or insurance when the legal limit is 35mcg. He was disqualified from driving for 20 months with costs of £85 and £30 victim surcharge. Jenny Marie Sanderson, 33, of Clumber Street Kirkby admitted driving with 78mcg of alcohol in 100ml of breath. She was disqualified from driving for 18 months and fined £120 with £30 victim surcharge and £85 costs. Thomas Bancroft, 22, of Rushpool Close Forest Town admitted driving with 69mcg of alcohol in 100ml of breath. He was disqualified from driving for 18 months and fined £250 with £30 victim surcharge and £85 costs. Samuel Gregory, 30, of Shaftsbury Avenue Mansfield admitted driving with 95mcg of alcohol in 100ml of breath, without insurance. He was disqualified from driving for 24 months and fined £240 with £30 victim surcharge and £85 costs. Dagmar Sosna, 38, of Milton Street Mansfield admitted driving with 103mcg of alcohol in 100ml of breath, without a licence of insurance. He was disqualified from driving for 28 months and a community order was made with an 80 hours unpaid work requirement an £85 victim surcharge and costs of £85 were imposed. Christopher Askham, 48, of Kneesall Close Meden Vale admitted driving with 81 mcg of alcohol in 100ml of breath. He was fined £400 with £40 victim surcharge and £85 costs and was disqualified from driving for 18 months. Andrew Luke Hudson, 25, of Worcester Avenue Mansfield Woodhouse admitted being in charge of a vehicle whilst unfit to drive through drink. He was fined £80 with £30 victim surcharge and £85 costs. His driving licence was endorsed with 10 points. Guntis Ruduks, 31, of Layton Avenue Mansfield admitted to failing to provide a specimen of breath for analysis. He was disqualified from driving for 20 months and fined £318 with £31 victim surcharge and £85 costs. Michael Rafe Davies, 31, of New Street, Kirkby admitted breaching a restraining order banning him from contacting a male and a female. It was conviction of an offence while a community order for an offence of harassment was in force. He was committed to prison for 12 weeks, with a victim surcharge of £115. Richard Moesby, 40, of Sutton Road Huthwaite admitted breaching supervision requirements imposed following imprisonment. He was committed to prison for a total of 26 weeks. Jamie Luke Ward, 28, of Iveagh Close Warsop admitted using threatening behaviour. He was fined £40 with £30 victim surcharge and £85 costs. Craig Anthony George Daft, 36, of Whaley Bridge Close Mansfield admitted using threatening behaviour. He was fined £98 with £30 victim surcharge and £85 costs.